We have become accustomed to having internet in the palm of our hand 24 hours a day, whenever we need it so when we travel and the excessive costs of data roaming come into play we become frustrated. This is where a portable WiFi router saves the day, hoorah! It might sound and look very high tech but these palm sized gadgets can get you online, anywhere in the world, at affordable prices and they are very easy to use. What is a portable WiFi router? A portable WiFi router is just like your internet box at home, but instead of being attached to a phone cable, they have a SIM card inside instead. If you get an 'unlocked' portable WiFi device, this means you can use any SIM card, from anywhere in the world, inside it. The benefit of this is that you can therefore always get the lowest rates as you can use a worldwide data SIM or a local SIM in it. A portable WiFi device will enable you to set up your own private internet connection, practically anywhere in the world, on at least 10 devices simultaneously, including phones, laptops, tablets and iPads, games consoles and cameras etc. How easy are they to use? The answer is incredibly. Once charged it is simply a case of popping in a SIM card and switching it on, then within seconds you can be surfing the internet on several devices simultaneously. Some companies only sell locked portable WiFi hotspots, this means you can only use that companies SIM card inside – this can therefore make it expensive to use when you travel. It’s best to get an unlocked WiFi router so you can use any SIM inside, that way you can always get a different SIM if necessary to keep your costs low in the country you are visiting. Portable devices vary in particular capabilities but as long as there is network coverage in the destination you are in you will be able to access the internet. Remember that not all countries support 4G so when selecting a device keep this in mind. Most portable WiFi hotspots can connect at least 10 devices and give you decent internet speeds, the Huawei E5577c 4G Mobile WiFi is a great example of this and affordable too. For those that are after something top of the range, the Huawei E5788 4G/5G Mobile WiFi boasts super fast 4G+ download speeds of up to 300mbps and gives you up to 600 hours on standby. If you are less fussed about internet speed you can pick up a portable hotspot like the Huawei E5330 Pocket WiFi which certainly won’t break the bank! What can I use a portable WiFi router for? You can use a portable WiFi router when you travel; whether for business or pleasure, when walking around, at home, in a small office or in the car (there are even special car WiFi devices). You can connect you /your family’s /business colleagues devices up to a secure network so you can all get online affordably. If you are travelling on business you can ensure you keep productivity levels high while you are out and about. Most portable WiFi hotspots are fairly small and light weight so you are not restricted where you can take them. Just make sure that the SIM you use inside gives good data rates in the country you are using it in. What options are out there? Size: some are pocket size some are larger. Functionality: Some have basic functionality (i.e. giving you internet access) where some have additional features like the Huawei E5788 that is also a powerbank to charge your devices and it has the ability to send and receive SMS. Compatibility: Although all WiFi hotspots are compatible with all WiFi enabled devices, there are options to plug direct in to your laptop or tablet using a WiFi USB, where others are a stand a lone gadget that can work without a laptop. Cost: The range in cost is actually quite vast; if you just want to get online when you travel a cheaper one like this ZTE will do, but if you plan on supporting a small office or want fast download speeds you should get one like this one with 4G+ speeds. Speed: There are both 3G and 4G and 4G+ WiFi hotspots on the market, with 4G+ being the fastest with speeds twice as fast as 4G. Locked/Unlocked: We covered this above - make sure you have the freedom to use any SIM inside so you can always get the best rates in the country you are in. The best thing about portable hotspots is that they allow you to keep in touch whilst on the move. 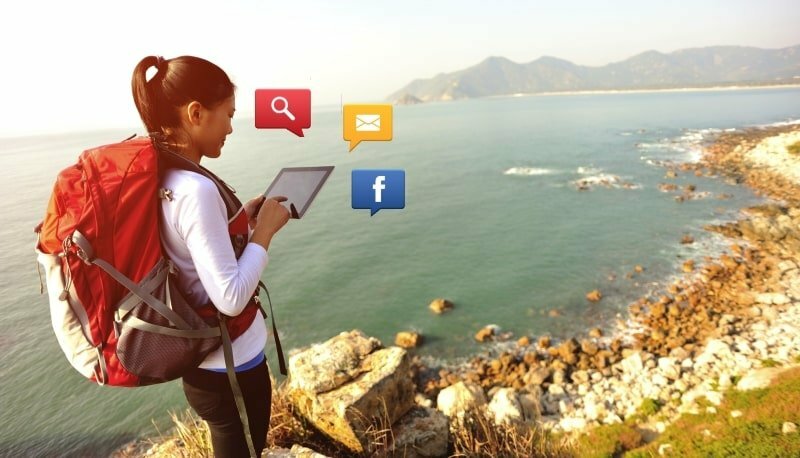 Whether it is updating your Facebook status with your travel photos, answering emails or finding local attractions. These handy gadgets are ideal for those times when there is no free WiFi and to safe guard yourself against hackers that prey on open WiFi connections. Check out our blog post on how to select the best WiFi hotspot for your needs or you can browse our online store for the lowest costs on a range of portable WiFi brands. How to Select the Best Local Sim Card for your Travels?